Normal wear and tear on your tires can cause the tire to become shallower with less tread over time, and this can cause changes in its performance. It is best to replace worn tread sooner rather than later if you anticipate driving in hazardous road conditions. With this in mind, it is important to check the tread depth and wear condition of all of your tires several times a year. Why Does Tire Wear Matter? Not enough tire tread can be very dangerous. Lack of traction on the road can cause a driver to lose control of his/her vehicle especially in wet or snowy road conditions. Whenever precipitation comes between your tires and the road, it is important to have enough tread to maintain as much traction as possible. What is the Minimum Required Tire Tread? In the United States, tire tread measurements are usually expressed in 32nds of an inch. The average new all-season passenger tire has a tread depth of about 9/32-inch to 11/32-inch.In most states, the minimum tire-depth requirement is 2/32-inch. Fred Martin recommends that tires be replaced when the tread reaches that depth. Fred Martin recommends that you replace your tires when any portion of your tire tread wears less than 2/32-inch in depth. 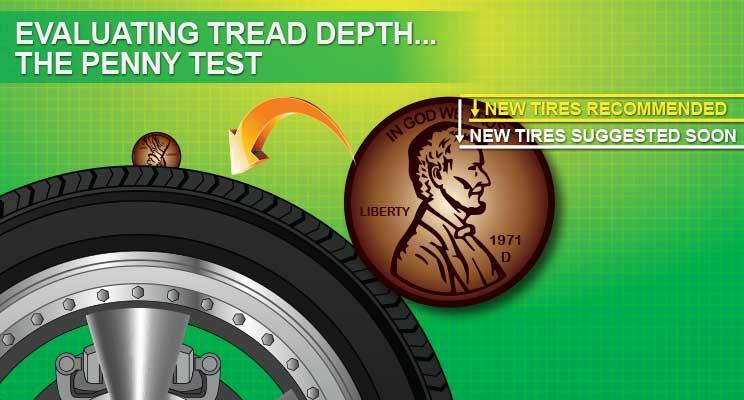 One method of evaluating tire depth is to use the “penny test.” Place a penny, with Lincoln’s head upside down, into the groove between the tread ribs. If you can see Abe’s whole head at any groove location, then you should replace that tire. What Can Cause Early Wear? Because vehicles, drivers, and driving habits differ from each other, tires do not always wear the same. Sports cars with high performance tires show wear and tear faster than touring tires on a family sedan. Two other factors can cause irregular tire wear: having the front end out of alignment and improper tire pressure. What is Improper Tire Pressure? Tires that are improperly inflated tend to wear unevenly. 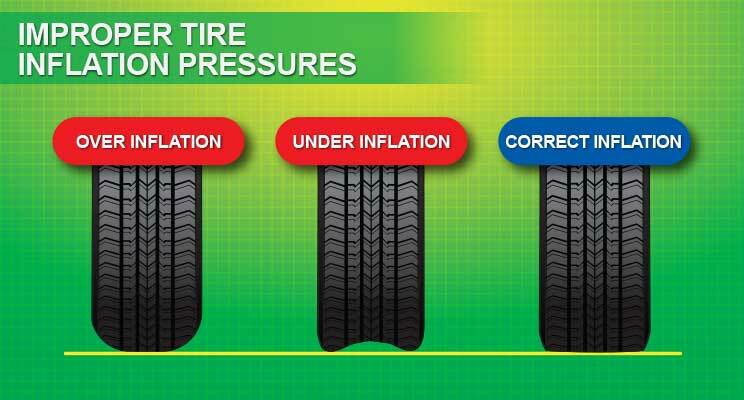 Vehicle manufacturers specify the tire pressure to optimize performance, handling and fuel economy. Wheel alignment can help your tires perform properly and last longer. It can also improve handling and keep your steering from pulling in one direction or another. One other symptom of misalignment is strange vibrations in your wheels as you drive down the road. When these symptoms arise, please see your Fred Martin Service Department. 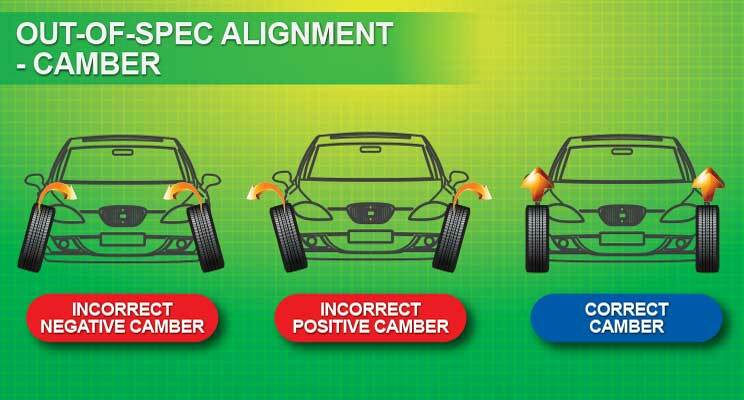 Tire alignment/wheel alignment refers to the adjustment of a vehicle’s steering and suspension elements and the system that connects and controls the motion of the wheels. It is not the adjustment of wheels or tires themselves. Camber: This is the outward or inward angle of the tire that is viewed from the front of the vehicle. Positive/Negative camber occurs when there is too much of an outward or inward angle. Worn bearings, ball joints, and other wheel-suspension parts may contribute to camber misalignment. 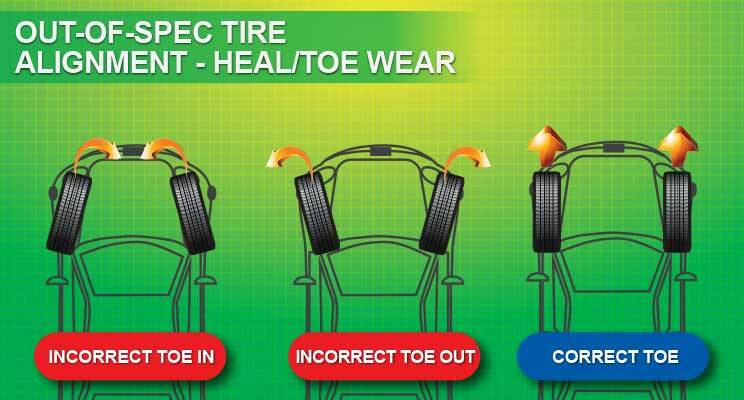 Toe alignment is the extent to which your tires turn outward or inward when viewed from above. Think about when your feet are angled inward towards the center of your body. When the tires on your car are angled the same way (in terms of birds-eye-view), this is toe-in alignment. Angle your feet outward and you have toe-out alignment. Both require adjustment. 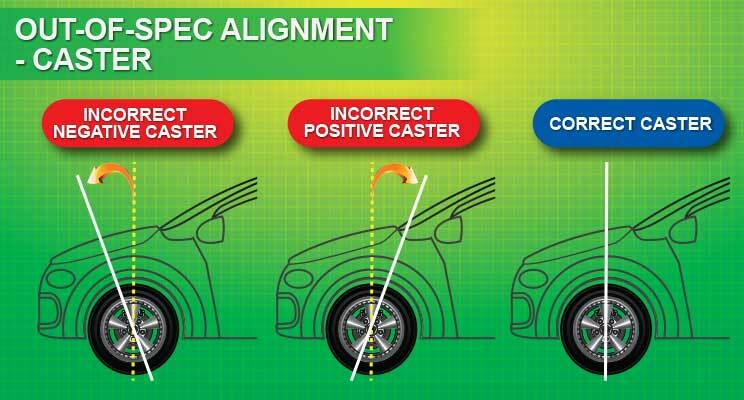 Your caster angle helps balance cornering, steering, and stability. This is the angle of your steering axis when viewed from the side of you vehicle. You have a negative caster when the steering axis tilts toward the front of your vehicle. If you have a positive caster, the steering axis is tilted towards the driver.